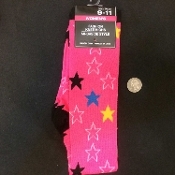 Adorable Hot Pink Black Multi-color stockings with cute various size Stars print. Fits adult women teen shoe sizes 4-10. 98% polyester, 2% spandex elasthane. Only non-chlorine bleach when needed. Do not iron.